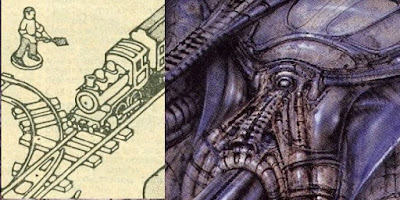 Alien Explorations: Erotomechanics VIII, work 423 (1979) by HR Giger references Illustration puzzle from Christmas 1974 Radio Times for "I've cracked it" featuring trains? references Illustration puzzle from Christmas 1974 Radio Times for "I've cracked it" featuring trains? Illustration by Michael Davidson puzzle from Christmas 1974 Radio Times for "I've cracked it"
a) Although the body references Giger's partner at the time, Mia Bonzanigo who modeled for it wearing clothing. I think it also referenced an almost rather banal Radio Times puzzle illustration from Christmas 1974, which he reversed. Someone back in the 1970s would have looked at the illustration, be a little more entertained and start thinking about toy train sets. b) Image reversed with painting. c) Hut wall posts turned into lines on the legs and hedge integrated into vertical lines on the leg. Train and hedge integrated into structure penetrating the female anatomy. 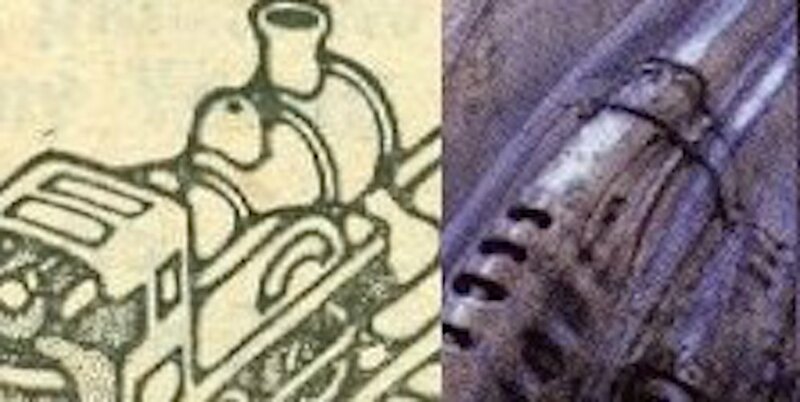 d) Front of train and track integrated into the female anatomy, the front of the train becoming a small eye like formation. I just sent the link to the owner of the painting.